A strong and very muscular dog for its size, the Staffordshire Bull Terrier has a broad head and strong jaws. Staffordshire Bull Terriers are loyal and love their families. The Staffordshire Bull Terrier originated in England. 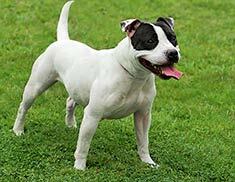 The Staffordshire Bull Terrier's coat can be black, blue, fawn or brindle with white markings. The soft sleek coat of the Staffordshire Bull Terrier requires minimal grooming. The loyal Staffordshire Bull Terrier grows to love its family and gets along splendidly with children. It can, however, be aggressive towards dogs outside of the family and difficult to housebreak. As a puppy the Staffordshire Bull Terrier tends to chew quite a bit. This breed is obedient and very people friendly. 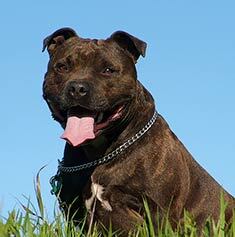 Staffordshire Bull Terriers are prone to tumors and cataracts and occasionally hip dysplasia. Staffordshire Bull Terriers can be expected to live under 10 years. Staffordshire Bull Terriers are extremely active and require fair amounts of exercise. A Staffordshire Bull Terrier must not be let off its leash in public places. Find Staffordshire Bull Terrier Puppies with our Free Breeder search!